In our last Kitchen Trends blog we talked about coloured kitchen cabinets and the range of colour options available. 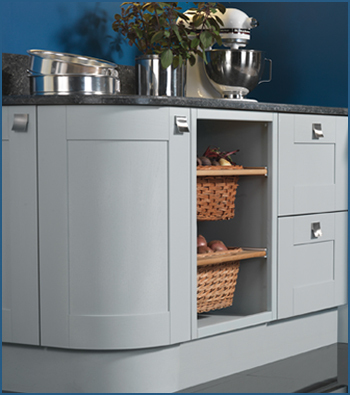 Since posting that blog, we find that we’re coming across a lot of kitchens in one colour in particular – blue. Judging by what we're being asked for and the design sites and publications we're reading, blue kitchens do really seem to be the colour of choice at the moment. However, even within this specific section of the colour scale, there is a huge range of variation from very pale blue/whites to dark and dramatic navy blues verging on black. You may think that blue is a bold and daring choice for a kitchen, and some tones certainly are, but many are surprisingly subtle and timeless. Blue greys and duck egg blues have been growing in popularity for a while now and these can work well in both modern and traditional style kitchens. Royal blues, turquoises and strong midnight blues are more recent entrants but are creating some beautiful kitchen spaces that really make a statement. Some of the very pale blues available are almost white while many have more than a hint of grey and can look different depending on the light. You can see here that both modern, minimalistic kitchens work well in pale blue, as does a more traditional, vintage style with Shaker doors and elegant curves. These have much more vibrancy about them and make a bold statement. You can see from these examples, these bright blues can be toned down with white or have their vibrancy enhanced with colourful, heavily patterned tiles. These blues have plenty of grey mixed in to create some lovely dusky blue shades. The first one has created drama by applying the same matt effect dusky blue to cabinets, walls and wood work with a pale floor and light natural wood worktop to break the large areas of single colour. The second has created a tone that seems to have variation within it and creates an almost velvet effect, teamed with high gloss splashback tiles. Black kitchens have always been popular but a dark blue gives you the same dramatic look but toned down some and less oppressive. They can work well with white or by following the dark theme throughout the space. The first example here features an inky blue with lots of depth and the second creates a Victorian feel that somehow still feels modern and fresh. You can see all of these kitchens, plus plenty of others that we didn't have the space to show here, on our Pinterest board - Blue Kitchens. We can offer a number of our kitchens in blue shades from blue greys such as Dove and Mist, through to Heritage Blue and the green/blues of Lead and Lichen. So if you fancy joining the latest trend and going for a bit of blue in your kitchen why not book a free consultation so we can show you exactly what it could look like! Call us on 0800 321 3491 or send us a message. 0 Responses to "Kitchen Trends Monthly Blog - August"